CLIMATE TALKS PROTEST. 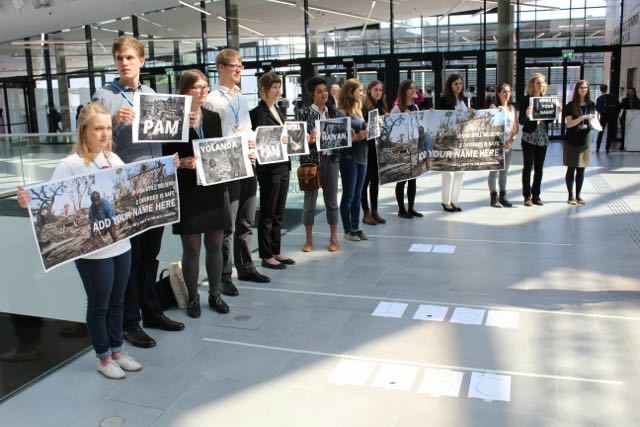 Young climate activists stage a protest during the intersession at Bonn this week, a crucial negotiations before the Paris climate talks in December this year. Photo provided by Ayeen Karunungan. MANILA, Philippines – In the wake of the G7’s announcement to limit global warming to 2 degrees, UN climate negotiators from the world’s most vulnerable nations have questioned whether 2 degrees is too dangerous. Care International’s Sven Harmeling has labelled this move “highly concerning,” especially given the human rights implications of a 2-degree target. They argued in line with the most recent report from the Intergovernmental Panel on Climate Change (IPCC) that people who are currently “marginalized are especially vulnerable to climate change,” even at only 2 degrees of warming. A UN report released earlier this year states that climate change accounts for 87% of disasters worldwide. This figure, it must be remembered, comes with only 0.8 degrees celcius of global temperature rise that we are now experiencing. However, scientists are largely uncertain what the impacts of a doubling of the current warming could be. Those countries most vulnerable to the impacts of climate change have been concerned about the reality of 2 degrees of warming since the UN climate talks began. Sering and other leaders of the Climate Vulnerable Forum commissioned a human rights inquiry into the 2 degree target earlier this year that has highlighted the severe impacts of 2 degrees for poor and marginalized groups around the world. These reports, and the current state of the UN climate negotiations around the 2 degree target have shone light once again on the importance of showing support to developing countries that will face the ongoing impacts of global warming. The Philippines is known to be one of the most vulnerable countries to climate change, along with other small island nations and developing countries. When Typhoon Yolanda hit the country in 2013, more than 6,000 people died and millions were affected, losing their homes and livelihood. Post-disaster problems such as human trafficking was also recorded. The impacts of climate change is fundamentally intertwined with human rights issues — the right to life, right to food, right to shelter, right to self determination especially those of the more vulnerable sectors such as women, children, persons with disability, and indigenous peoples. The impacts of climate change has left many Filipinos with dead families, no homes, destroyed crops, and lost hopes and dreams. According to Oxfam, climate change is the number one threat to overcoming poverty. Many Filipinos undergo a cycle of building and rebuilding their lives only to be continually destroyed by climate change impacts. At less than one degree warming, the Philippines is facing extreme weather conditions, warming waters, drought, and sea level rise. What this means is that the Philippines must be prepared to face more Yolandas, less food production due to low adaptive capacity of farmers and fisherfolks, and more migration as islands sink under water. Within the UN climate negotiations, many fear that financial support for adaptation and the damages that cannot be adapted to will not meet the required targets. This is what led negotiators and civil society actors to stage a protest today in the UN climate talks demanding that negotiators not only recognize the importance of limiting global warming to 1.5 degrees, but also reinvigorate negotiations to better support the inevitable damages that will result. Interestingly, this has been one of the key negotiating points for India over the years. However, with its plans to push ahead with its controversial coal plant in the pristine Sundarbands region of Bangladesh, and ban NGO’s from criticizing, it may indeed be set on a development path that is at odds with its developing country partners. In addition, the Philippines must look into its own plans for clean and renewable energy. With more coal power plants set to be opened in many different parts of the country, the question of sincerity on the government’s call for reducing carbon emission remains questionable. It is only a matter of time before the true “reality” of a warming world sets in.